Dr. Robert Wergin, a family physician based in Milford, Neb. said a 27.4% cut to his Medicare payments would devastate his practice. 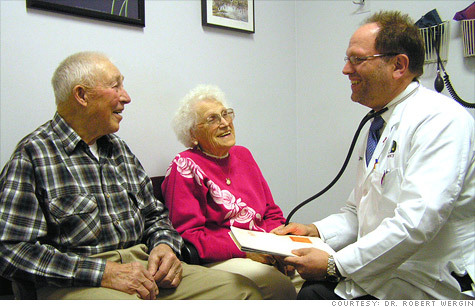 NEW YORK (CNNMoney) -- The payroll tax impasse in Congress has put Medicare doctors on edge over the likelihood that their pay could be slashed 27.4% in two weeks time. Under current law, health care providers to the nation's 45 million Medicare beneficiaries -- including physicians, nurse practitioners, physical therapists and podiatrists -- face reduced government reimbursement payments on Jan. 1. But the payroll tax cut bill also includes a "patch" that would have prevented the Medicare payment cuts from occurring in the New Year. The problem is that the bill, passed by the Senate, has been rejected by the House -- and both chambers of Congress, for now at least, have recessed for the year. Dr. Robert Wergin, a family physician who operates a solo practice in Milford, Neb., is worried. "I like to think these politicians are intelligent people and they will come to their senses," Wergin said. "Now I'm worried that maybe they won't." As a rural family doctor, Wergin is especially vulnerable to Medicare cuts. About 30% of his 3,500 patients are on Medicare. "Rural America has a growing aging population," said Wergin. "I have a larger number of Medicare patients. I have to see them. I can't limit how many I see for fear that they are not good for my business." But this scenario also creates a challenging business environment for him. Wergin said he may be forced to pick up his business and move to a community with a smaller Medicare population. "I really don't want to do that. I've lived in Milford for 20 years and have important ties to this community," he said. Fed up with temporary fixes: For doctors who accept Medicare, the situation playing out in Washington is a familiar one. Federal law requires that reimbursement rates be adjusted annually based on a formula tied to the health of the economy. That law says rates should be cut every year to keep Medicare financially sound. But Congress has blocked those cuts from happening 12 times over the past decade, and could still do so this year. The American Academy of Family Physicians, which represents 100,300 family doctors, issued a statement Tuesday expressing "outrage that Congress failed to prevent the 27.4% Medicare physician pay cut mandated by current law." "For some family physicians, Medicare patients comprise as much as eight in 10 of their patients. No business can sustain such immediate and draconian cuts to their revenue," the group said. The continuing uncertainty and temporary fixes by Congress are driving doctors away from Medicare patients, said Dr. Glen Stream, president of the family medicine organization. "People also don't think of doctors' practices as small businesses, but many of them are. The only revenue coming in is payment for services," he said. Dr. Daniel Spogen left his private practice six years ago because he wanted to "get rid of the Medicare payment problems." He is currently a professor and chairman of the family medicine department at the University of Nevada's School of Medicine. "Luckily 50% of my former patients followed me and stayed as my patients after I joined the university," he said. But Medicare's payment problems have followed him there, too. As state funding for the university hospital has decreased recently, Spogen said the hospital is relying on Medicare payments to not only adequately pay doctors but to also help in keeping the school going. Deborah Chollet, senior fellow and health economist at Mathematica Policy Research, expects the annual brinksmanship over Medicare payment cuts could drag on for a few more years. "It's not a pleasant situation for anyone," she said. "There will be a tipping point. What this will do over time is eliminate the solo practice doctor and push the health care system on a bumpy ride to a new environment." Correction: Due to incorrect information provided by the AAFP, an earlier version of this story misreported the results of the group's survey.